Not for the first time during his ring career, superstar Manny Pacquiao has asked fans to vote on who he should fight next. This time, allowing his fans to choose from four fighters – Floyd Mayweather, Keith Thurman, Shawn Porter and Danny Garcia – Pacquiao received over 44,000 votes from his followers on twitter. And Pac Man has a clear fan favourite as far as who his next dance partner should be: Floyd “Money” Mayweather. Mayweather – who teased us late last year that he would be fighting Pacquiao a second time, in a rematch of their pay-per-view smash hit “Fight of The Century” from May of 2015 – pulled in an overwhelming majority of the votes cast: 74% of them to be exact. Thurman got just 12% of the votes, Garcia 9% and Porter a lowly 5%. Interestingly, Pacquiao did not add the name of Errol Spence to his voting list. In any case, it seems, from this online poll at least, that there is still plenty of fan interest in a Mayweather/Pacquiao II; this despite the fact that the first fight sucked and despite the fact that both guys are now into their forties. Besides, Mayweather has said a number of times how he is not interested in coming back to fight anyone (not in a real fight anyway; Mayweather knowing he can pick up a bundle from a no-risk exhibition bout the likes of which we were witness to in Japan on New Year’s Eve). 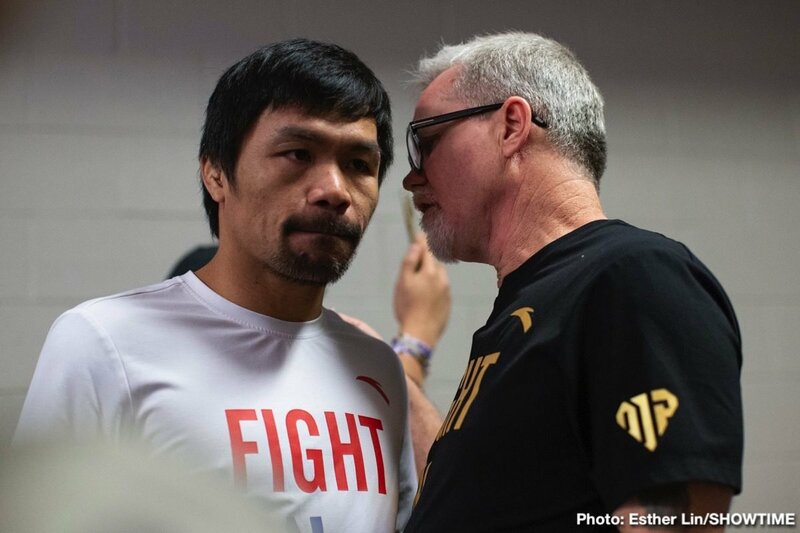 There would perhaps, maybe, be some intrigue to a return fight between the two greatest fighters of their era, in that Manny did have THAT shoulder problem in the May 2015 fight that saw him go down heavily on points over 12 dull rounds. Just maybe, at full health with both his arms in full working order, southpaw Pacquiao would be able to do something against 42 year old Mayweather. But will we get to see the fight? There are still fans who want to see it – at least 32,560 of them – but it will be down to Mayweather and what he wants. What else is new?